This charming romantic holiday-cottage is suitable for 2-4 people and can be rented from 490 euro per week. This holiday cottage is set on a large plot of approximately 1000m2, and situated next door to our own home, Although the cottage had been empty for about 50 years and was used as a stable, it was once inhabited. We think the house is around 150 years old. It is a small farmhouse, built from local granite, with walls over half a metre thick, with a beautiful Cantou (Fireplace) of solid granite and a slate roof. 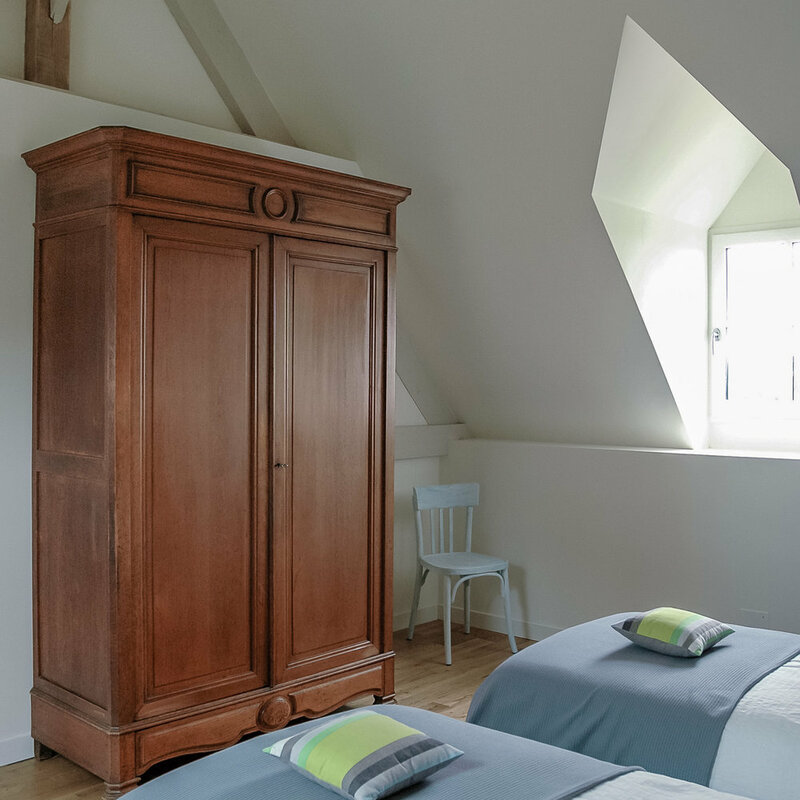 We have restored the house with natural materials, resulting in a lovely mix of authentic details and modern comfort. The cottage is a charming and inviting home with oak beams, traditionally pointed granite walls and insulating hemp walls. On the ground floor you will find a cosy living-room with a granite fireplace with a wood burning stove and an inviting spacious kitchen. Upstairs there are two spacious bedrooms, one of which has a roll top bath. This bedroom has a king-size bed, the other bedroom two single beds. A baby cot and chair can be added at no extra cost. There is a luxurious bathroom with a walk-in shower, and a separate toilet. The holiday cottage has private access, with plenty of parking-space and is set in a lovely private garden, with a spacious south-oriented terrace. Gîte de France awarded us the label "Gîte au Jardin". 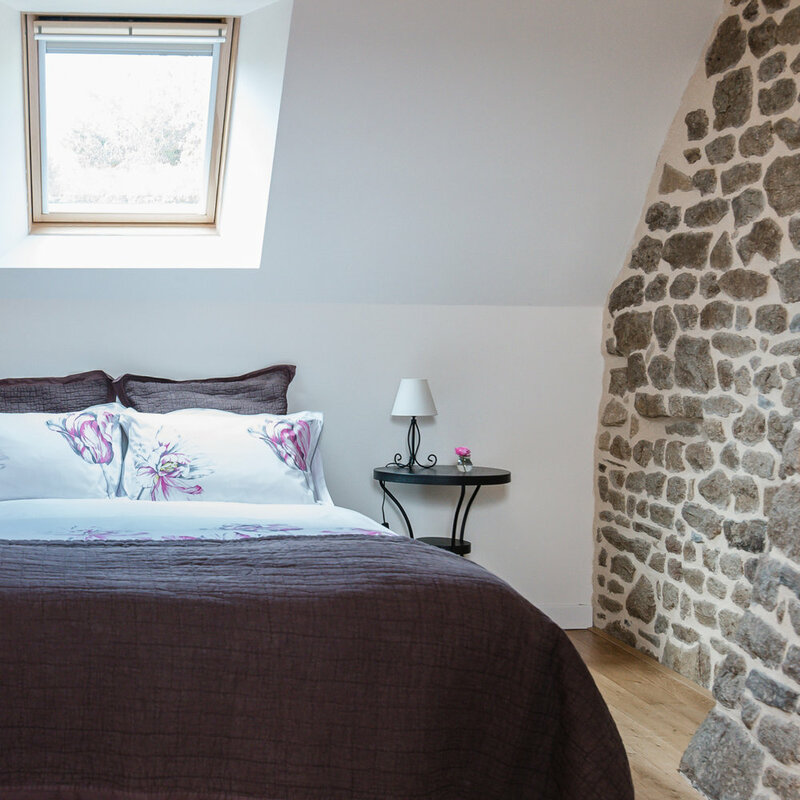 The gîte is situated at around 260 meters above sea-level and has a lovely view over the hilly Bocage ; plenty of opportunity to enjoy lovely sunsets and starry nights. Of course the cottage is equipped with all mod cons such as; a washing machine, a dishwasher, micro-wave, electric oven, ceramic hob, fridge-freezer, filter coffee machine, electric kettle, toaster, TV with DVD player, Hifi set, wood-burner, comfortable beds, a hairdryer and a selection of books and games. Those little extras like ecological dishwasher tablets, washing up liquid, toilet rolls, bin bags, salt and pepper, herbs, sugar, tea, and coffee are all in place for your arrival. We would appreciate it if you could replenish stock when finished. We hope to See you soon in our charming holiday cottage!